During bill-signing season, Gov. Ralph Northam gets invited to lots of dog-and-pony shows. But this one had actual ponies. After a bugler wearing a red jacket and top hat played the ceremonial first call, Northam walked out of the shuttered Colonial Downs horse racing track and signed legislation to expand horse race gambling in Virginia and clear the way for the track to reopen next year. The bill the General Assembly passed earlier this year legalizes historical horse race wagering in Virginia, a new type of pari-mutuel gambling that lets players bet on past horse races using terminals that look and feel like slot machines. The machines will bring a major new revenue stream for the new Colonial Downs owners, Chicago-based Revolutionary Racing, as well as the equestrian groups that saw their industry slow to a crawl after Colonial Downs closed in 2014. 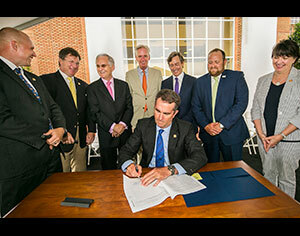 Technically, Northam signed the bill in April, when he also instructed the Virginia Racing Commission to put “reasonable limitations” on the new machines. But Friday’s event gave officials an opportunity to publicly highlight what they called a momentous occasion for Virginia’s racing industry and New Kent County. A crowd of hundreds gathered at the track for the ceremonial signing, mingling under cloudy skies and holding wine, beer and popsicles as they waited for the governor to arrive. “We hoofed it here as quickly as we could this afternoon,” Northam said. Joined onstage by several Republican lawmakers, Northam called the bill a bipartisan accomplishment that will revive a struggling industry and bring broader economic benefits. “Racing is back!” exclaimed Del. Michael Webert, R-Fauquier, the bill’s sponsor. Thoroughbred racing is expected to return to Colonial Downs next year after the new owners renovate the facility. When the new-look Colonial Downs reaches “full capacity” in 2022, the facility could have an annual economic impact of $349.1 million, support more than 1,400 jobs and produce $41.7 million in state and local taxes, according to an analysis released by the company. Friday’s event also marked the first major public appearance by some of the out-of-state businessmen who bought Colonial Downs in April for more than $20 million. State lawmakers had introduced bills to legalize historical horse race wagering in several previous sessions, but the proposals never advanced in what has been a gambling-averse legislature. Senate Majority Leader Tommy Norment, R-James City, who sponsored the bill in the past, also attended Friday’s event, where he complimented Northam as a “pretty good horse trader” and quoted Thomas Jefferson on the “considerable profit” to be had from Virginia horses. “I think that we all here in New Kent County and our friends from Revolutionary Racing are certainly hopeful that this is not going to be just an asset but a very profitable undertaking for the entire commonwealth of Virginia,” Norment said.